Airbus Corporate Jets (ACJ) hopes Asian customers will bite on the successes of the commercial Airbus A320neo and upgrade their ACJ fleets to the new engine option (neo) models. ACJ delivered its first ACJ320neo to Acropolis Aviation on January 16, 2019 (which then delivered it to AMAC Aerospace in Basel for completion), and the second on March 12 to Comlux, also in Switzerland. The first ACJ319neo is due for its first flight in a few months. “We expect our current ACJ320 customers to upgrade and turn to the A320neo. However, it really depends on the age of the aircraft,” said ACJ vice president Chadi Saade. “They would usually keep the aircraft for six to ten years. Most would usually also want a new ACJ, which gives them the option to fly further with the additional fuel tanks not found in second-hand conversions,” he added. There are more than 30 ACJ320 family aircraft in service within Asia, including 20 in China, and Saade is optimistic the number will rise. Debuting at ABACE for the first time on the static display is an ACJ319 operated by Taiwan’s EVA Airways. Saade said there should be some change in perception about the ACJ as an overly large and expensive aircraft. The ACJ320 has a similar wingspan to most large business jets, and thus takes up similar hangar space, and also has similar operating costs. 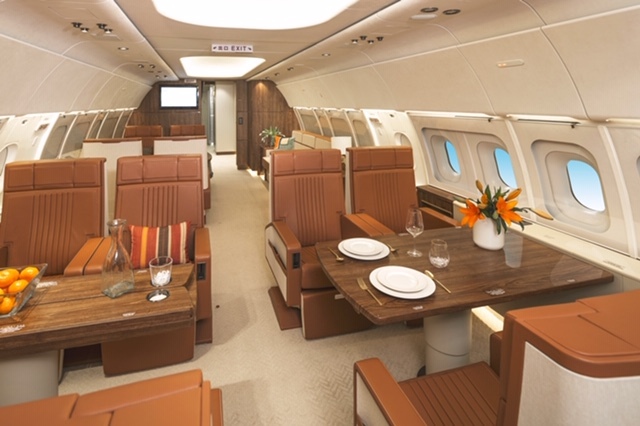 However, the ACJ boasts three times more cabin space than its business jet counterparts, ideal for high net worth customers traveling in excess of 15 hours, he explained. Currently, Saade said, there are no plans to add the Airbus A220 regional aircraft into the ACJ portfolio, although it is "highly successful" in the commercial airline sector.